We have split the "how to fillet fish" section into three parts because we felt it was more important to have big clear photos showing fish filleting rather than a single page with many small pics of fish. On the last page we have just cut over the belly flap and cut any remaining attached sinew or skin and is removing the first fillet. Remember the first fillet on the opposite side has already been almost cut off but has been left in place to support the backbone while he works on the other side. 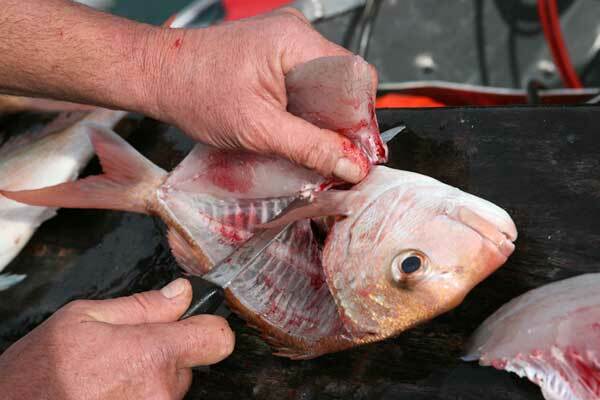 Release the rest of the fillet from the backbone. Note : The fillet fish cleaning board is solid Jarrah around 250 mm wide and runs completely around the transom and cockpit gunwhales of his aluminum boat. It is amazing how much meat is available after the fillets have been removed. 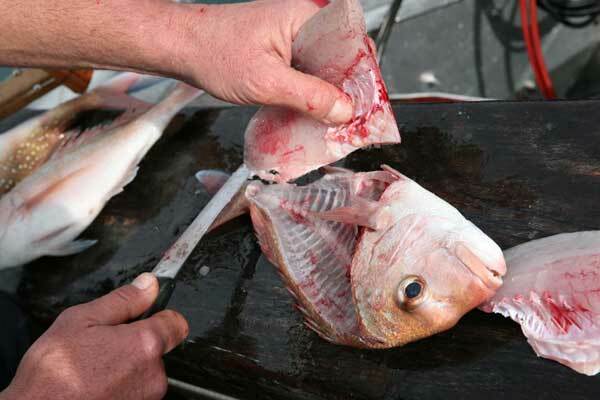 Remove the gills and clean the gut cavity and you have the makings of a tasty fish soup. Or, cut the backbones from the heads and fry the backbone in butter. Season with salt and pepper and enjoy. 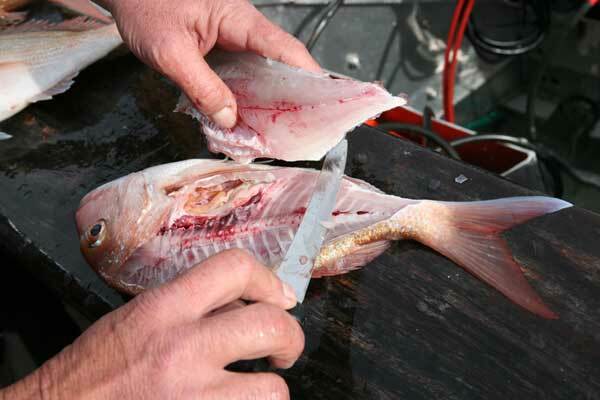 Then remove the heads from the pair of pectoral fins. Prop the cleaned heads and fins (wings), mouth end facing upwards in a pot, add enough water to just cover the bottom of the pot by half and inch (12mm) and fit a tight lid. Steam on high heat for five to 10 minutes, depending on the size of the heads, before lifting the heads and wings carefully out and standing them - the same way they stood in the pot - on a plate. Don't overcook! 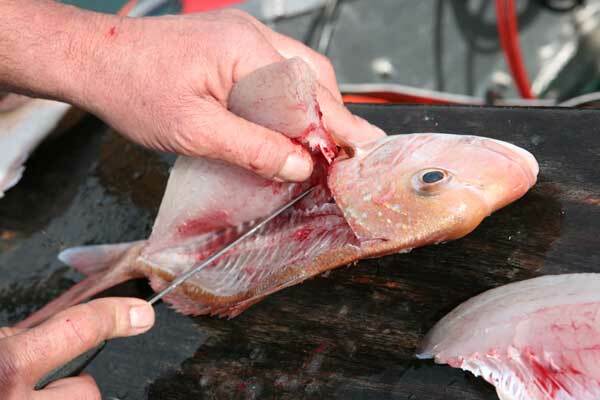 Take a blunt table or butter knife and run it around the fish head and wings to remove skin and scales, it will come off very easily. Remove skin and scales from the plate and put a knob of butter on the top of the fish head and wings and season with salt and pepper before serving. This is simply delicious! The most - and best - meat is in the wings so if you can't bring yourself to eating a fish head do yourself a favour and try just the wings first.